Kinako or roasted soybean flour is widely used as a common ingredient to make traditional Japanese confectionary. Selectively using dark roasted kinako made in Hokkaido, this kinako ice cream is deliciously nutty and toasty. 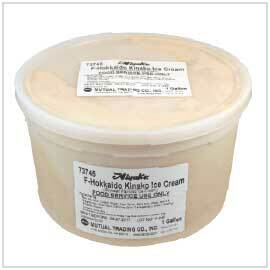 The exquisite balance of ingredients yields a creamy, and rich ice cream. Serve with a drizzle of Kuromitsu (black honey) for extra depth and sweetness or with anko (sweet red bean paste).